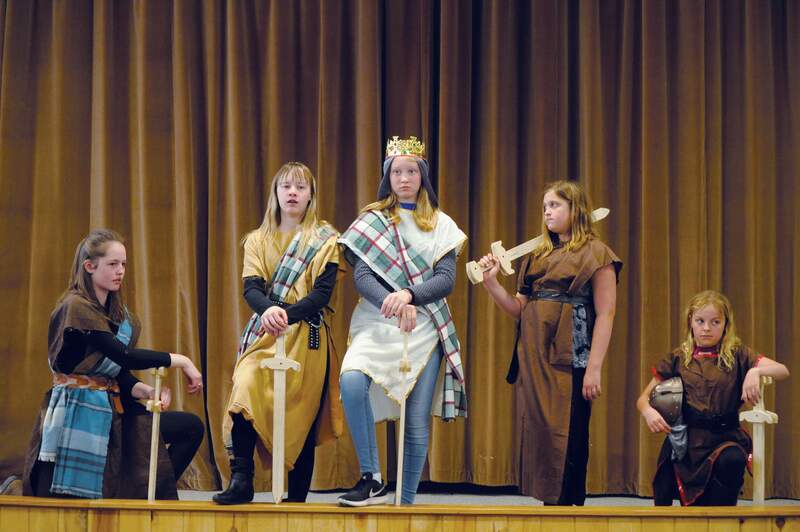 From left, Alaina Wray, Gwyneth Prothero, Morgan Holley, Lainey Wilson and Roan Harvey rehearse ahead of this weekend’s performances of “Macbeth” at Mountain Middle School. “Macbeth,” the classic tragedy of what happens when power goes unchecked, is being staged as part of one of Mountain’s Student Interest Group classes. The sixth-, seventh- and eighth-grade students began rehearsing the play before the holiday break in December. The version the students are performing, while pared down to about an hour, doesn’t shy away from the Bard’s poetic language, something that seemed a little daunting at the beginning. “It was a little tough to understand at first; it sounded like it was just thrown in there randomly,” said sixth-grader Abi Dendy, who plays one of the witches. Directing the play is Jason Lythgoe, who has been teaching theater to children for years, most recently at the Durango Arts Center. For Lythgoe, challenging the students was something they really responded to, and he said he’s excited to share the result of their hard work. In fact, he said, the play was a collaboration between him, Macon and the students, who came up with ideas for costumes and sets. When: 7 p.m. Friday and Saturday; and 3 p.m. matinee Saturday. Where: Mountain Middle School stage, 108 W. 31st St.
Tickets: $8 at the door (cash or check only).